Monica was classically trained at the Eastman School of Music. She has studied with several esteemed flutists such as Bonita Boyd, Susan Levitin, and Brad Garner. After graduating Monica found a deep love for the sounds of various world and hybrid flutes that called her to New Age music. It is a genre with classical, jazz and world music overtones that is intended to inspire, relax, and create optimism. In addition to C flute, her flute collection includes bamboo, Native American, pan, alto, and bass. Her newest addition is a hybrid flute extension called the ‘Zi Fi’, which is a fusion flute that crosses a traditional flute with a Chinese Dizi and a reed instrument. 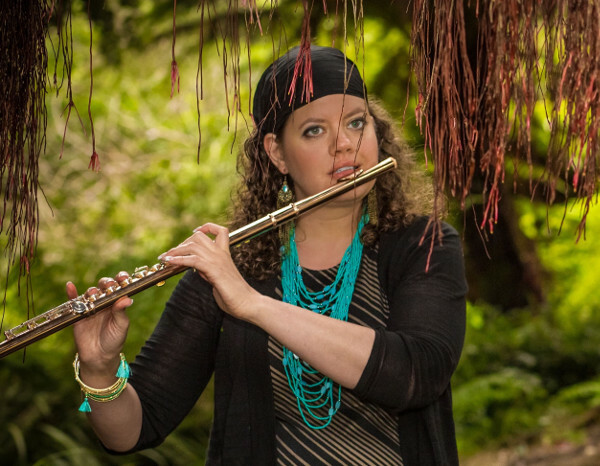 She co-founded the ensemble Phoenix Rising and is a freelance flutist for various groups and recording projects in the area. She currently has four CD’s including ‘Whispers’ by Phoenix Rising, ‘Ascension’ by Phoenix Rising, ‘Mystic Places’ by Phoenix Rising, and ‘Silences Between’ by Monica Williams. Phoenix Rising (flute and pianist/composer- Wendy Loomis) can be heard on radio stations including ‘Soundscapes’ by Music Choice and ‘Spa Channel’ by SiriusXM. Monica shares her love of music with the next generation at Civic Arts Education where she teaches 35 students and is the director of Flock of Flutes. She teaches at Civic Arts Education in Walnut Creek and her home studio in San Francisco. Her students have been selected to perform at the Honor’s Performance Series at Carnegie Hall, High School and Junior High School All State Bands, Contra Costa County Honor Bands, All Northern Honor Band, District Bands, Berkeley Youth Orchestra, Oakland Youth Orchestra, Sunset Youth Orchestra, Young Person’s Symphony Orchestra, and Cal Poly CA All State Band. In addition her students have won numerous awards including Command Performances at CMEA Solo and Ensemble, Finalist for the San Francisco International Flute Festival, Youth Focus Competitions, Royal Conservatory Music Development Program State and National Awards. Monica is no stranger to the award circuits herself. The music ensemble Phoenix Rising has been nominated in the best Classical, New Age and Jazz categories by the Hollywood Music and Media Awards, the Los Angeles Music Awards, and the Independent Music Awards. Additionally, she has won and been recognized by several national solo competitions with organizations such as Civic Union League of Chicago, Chicago Flute Club, Rochester Flute Club, and the National Flute Association. Monica is a member of the California Music Educators Association (CMEA), Contra Costa Performing Arts Society, ASCAP, National Flute Association (NFA), as well as a founding teacher for the Royal Conservatory’s Music Development Program, where she a center representative. She creates melodic lines full of mystery, magic, and grace on her last CD ‘In my Dreams Again’. “As a flutist I find that the flute is an extension of my inner voice. On this CD I played ten different flutes to help create a unique character and flow for each piece.